LEBANON, Tenn., April 1, 2018 /PRNewswire/ -- This Easter, Cracker Barrel Old Country Store® helped approximately 4,000 military family members gather around their tables to enjoy a festive meal together by donating Heat n' Serve Easter Family Meals To-Go. To distribute the meals in locations across the U.S. where needs among military families are greatest, Cracker Barrel® collaborated with its flagship nonprofit partner Operation Homefront, continuing Cracker Barrel's support of Operation Homefront's mission of building strong, stable and secure military families. 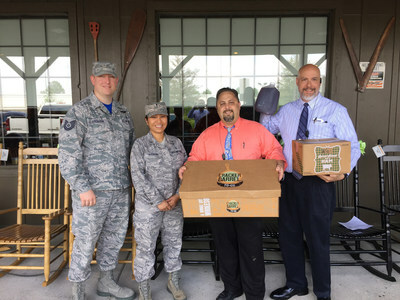 This Easter, Cracker Barrel Old Country Store and Operation Homefront helped provide 400 military families a Heat n’ Serve Easter Family Meals To-Go. The meal serves up to 10 people and includes spiral sliced ham, mashed potatoes, roasted gravy, three country sides, sweet yeast rolls and sweet blackberry cobbler, all accompanied with a gallon of iced tea. Approximately 4,000 military family members were invited to enjoy a donated Heat n’ Serve Easter Family Meals To-Go from Cracker Barrel. Cracker Barrel collaborated with its flagship nonprofit partner Operation Homefront, continuing Cracker Barrel’s support of Operation Homefront’s mission of building strong, stable and secure military families. On Good Friday, March 30, 400 invited military families picked up meals from Cracker Barrel locations that were designed to be stored at home in their refrigerators and then heated on Easter, so they can enjoy a hassle-free holiday of relaxing and connecting with one another. 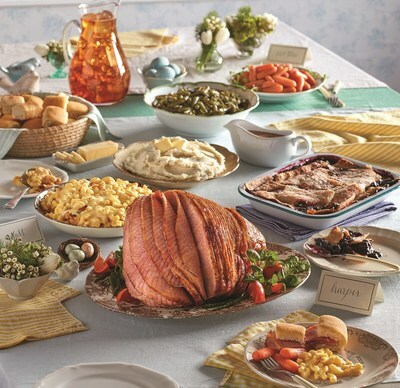 The Heat n' Serve Easter Family Meals To-Go serve up to 10 people and include spiral sliced ham, mashed potatoes, roasted gravy, three country sides, sweet yeast rolls and sweet blackberry cobbler, all accompanied with a gallon of iced tea. "Military families make incredible sacrifices in service to our country," said Cracker Barrel Manager of Corporate Citizenship Sloane Lucas. "Spending quality time together around a meal is a luxury for most families these days, but especially military families who face the extra challenges of lengthy deployments and transitions back to civilian life. Through our program, we are able to honor some of our nation's military families by sharing with them the cooking that makes Cracker Barrel a 'home away from home.'" Since its founding shortly after 9/11, Operation Homefront has served tens of thousands of military families across the country. The organization provides valuable programs to prevent short-term needs from turning into chronic, long-term struggles. "We are incredibly grateful for Cracker Barrel's support again this Easter," said Brig Gen (ret) John I. Pray, Jr., president and CEO of Operation Homefront. "Thanks to their unwavering commitment to helping those that defend the freedoms we enjoy daily, 400 military families are able to enjoy this special holiday at home together, in the communities they have worked so hard to protect." Cracker Barrel has long supported military-focused programs, including Fisher House, National Military Family Association, Children of Fallen Patriots Foundation, United Through Reading, the National Museum of the United States Army, and The Legion Fund, among many others. Since selecting Operation Homefront as its flagship nonprofit partner in 2016, Cracker Barrel has donated nearly $900,000 to the organization in financial support and goods. By supporting the families of those serving in the U.S. armed forces, Cracker Barrel believes it can make a deeper, more meaningful and lasting impact. Cracker Barrel Old Country Store, Inc. (Nasdaq: CBRL) shares warm welcomes and friendly service while offering guests quality homestyle food and unique shopping – all at a fair price. By creating a world filled with hospitality and charm through an experience that combines dining and shopping, guests are cared for like family. Established in 1969 in Lebanon, Tenn., Cracker Barrel and its affiliates operate 650 company-owned Cracker Barrel Old Country Store® locations in 45 states and own the fast-casual Holler and Dash® restaurants. For more information about the company, visit www.crackerbarrel.com.